The allure of Morocco cannot be underestimated. In a region that crosses between African, Arabic, and Mediterranean cultures; the country immediately conjures up a thousand exotic images. Morocco might be the perfect getaway you could say. But if travel seems impossible at the moment, then perhaps a Moroccan inspired bathroom can be an escape from the hustle and bustle of everyday living. Color. While the stroke of a paint brush cannot magically transport a country’s rich cultural tapestry into your home, it does a fantastic job of recreating the correct atmosphere. In this case, think of spices and a romantic Mediterranean sunset or sunrise. Hues of blue, sand yellow and burnt orange serve as the foundation of a Moroccan inspired bathroom. This color palette is plush but it is also warm and inviting. Décor, Lighting, and Accessories. Morocco is a mixture of various ethnic influences and it shows in their architectural design. One prominent element is the arch doorway. However, adding this feature may be too impractical. A way to get around this is to include geometric patterns. Yves Saint Laurent’s master bathroom brilliantly demonstrates this via the window shutters (perfect for windows for this style of bathroom), wall mosaic, and floor tiles. Unless you are fabulously wealthy or have enough cash, totally renovating the bathroom in this fashion can be discouraging. However, one of the simplest ways of bringing a Moroccan touch to any living space is with lighting fixtures. Brass or wrought iron lighting fixtures can highlight the color palate. Further, mirrors with ornate frames or blue and white ceramic bowls are affordable accessories that can bring a Moroccan-inspired bathroom to life. Tiles. Together with arch doorways, tiles are a substantial ingredient. In subtropical Morocco, tiles are a necessity against heat.Meanwhile, in the comforts of your own bathroom, tiles will not only protect the walls against moisture but it will also establish the grand feel of a hammam. 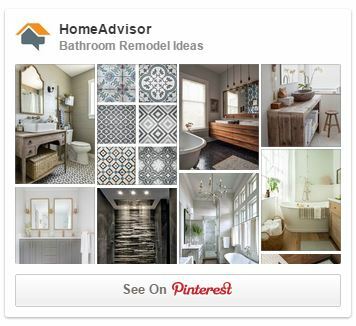 There are a number of choices for this and the creative homeowner can explore the possibilities. Options include a wall mosaic, ceramic tiles with painted patterns, glass tiles, or a clever and tasteful combination of the three.For those on a budget, glass tiles can serve as accents to basic white and blue ceramic tiles. The reflective surfaces of the tiles add a layer of opulence to the overall design. Remember to not skip on the tiles. Color and accessories can work wonders but tiles basically hold this project together.With the right framework, transforming the bathroom into a Moroccan sanctuarycomes easier. So even if vacation is on hold, you can still wash your worries away in that warm bath. Enjoy your bathroom! 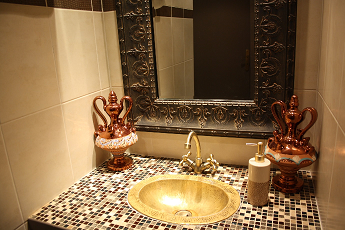 It’s Roberta Madison’s dream to have a Moroccan styled bathroom. She gets a lot of inspiration from her work as marketing manager at GlassTileStore.com, which is known for its beautiful glass tiles and other tile products such as mosaic tiles and exotic tiles. Follow GlassTileStore.com on G+.